Hi friends. 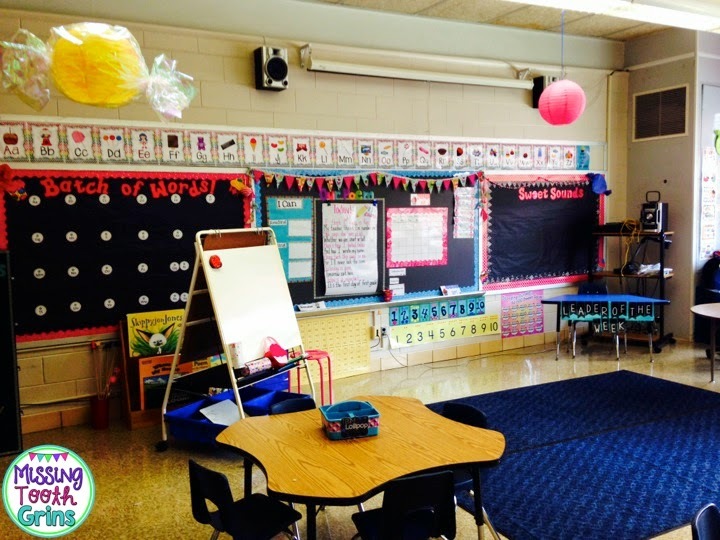 I originally posted this post about my classroom on Sunday. 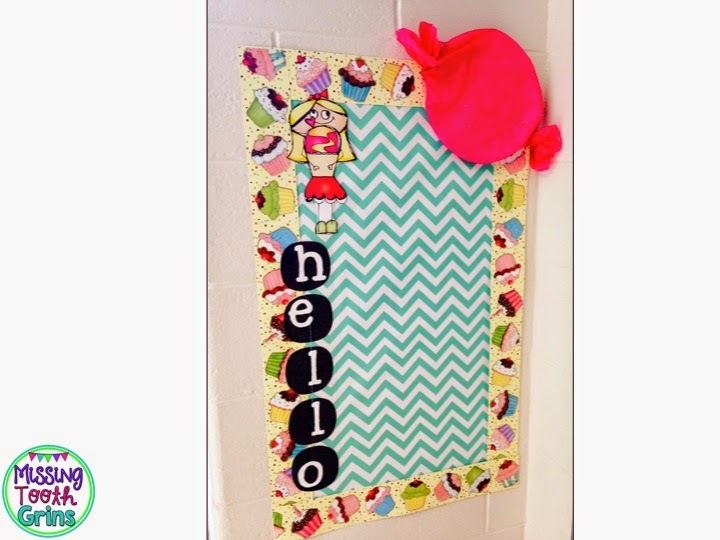 However, since I started school, I added a little something so I wanted to share that with you! 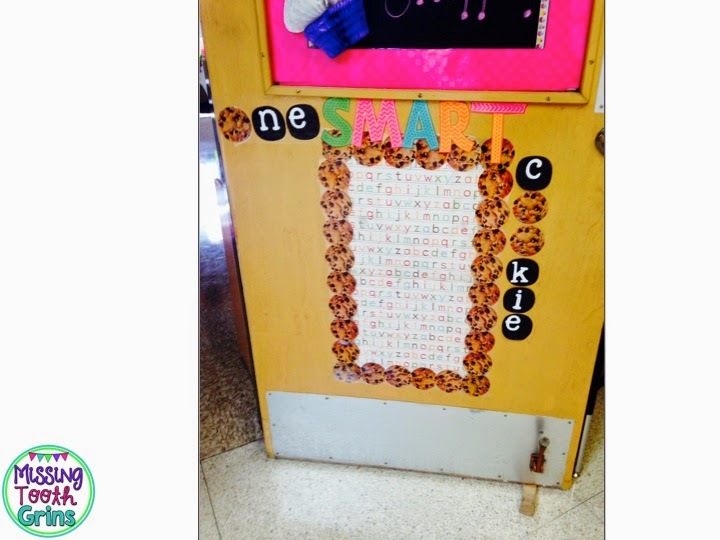 I finally got my One Smart Cookie (our version of Student of the Week) up and ready for the kids! 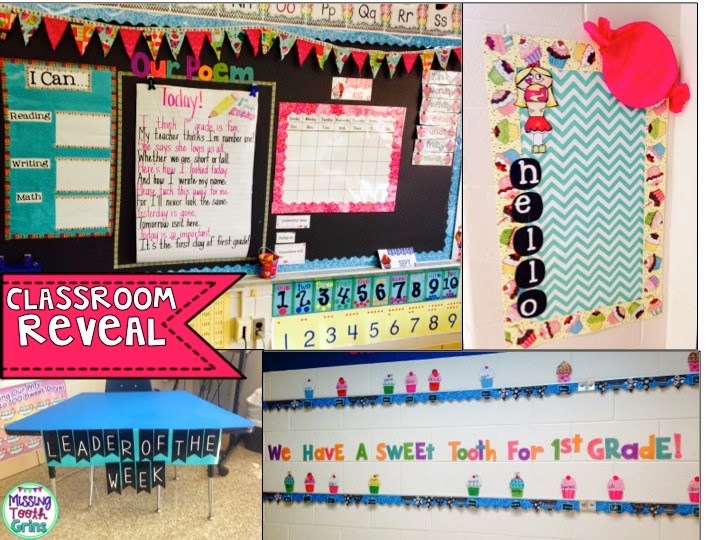 I wanted to include what that looked like in my classroom reveal! 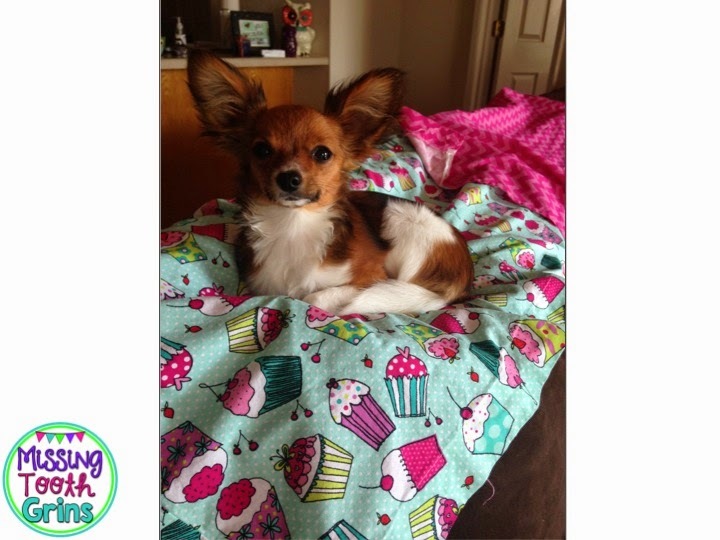 I'm also going to link up with the ladies from Bloghoppin' to show you where I spend a good portion of my days! Yes, tomorrow. AHHHHH! So, I'm in full freak out mode! 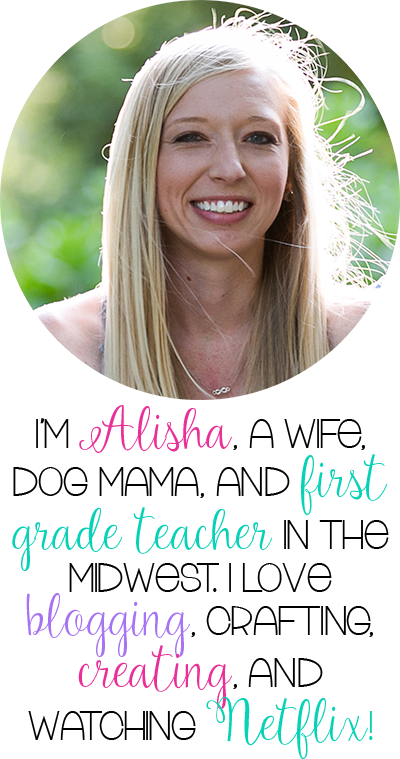 I'm excited and nervous and scared and happy and worried and so many more feelings and emotions that I know all teachers feel on the first day. Okay, at least I hope that you feel all those same emotions or else I feel like a crazy person. 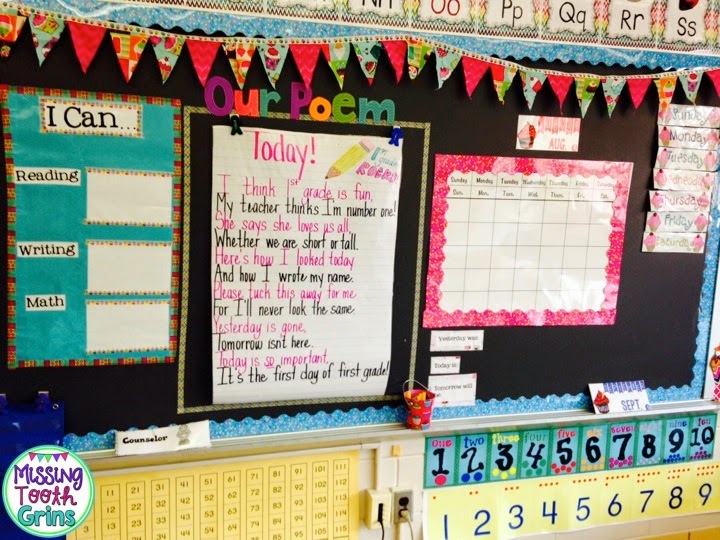 Anyway, I'm here to show you my classroom. Just to warn you, there are pieces that I hadn't quite finished when I took all these pictures and there are areas that I still need to finish, but the big stuff is done and I thought since school starts tomorrow, you may like to see it. These photos were taken with my iPhone. Quality isn't perfect, just FYI. Prepare yourself for a big photo dump. When you walk in my room and look to the right, this is what you see. Ice cream cone from Target. 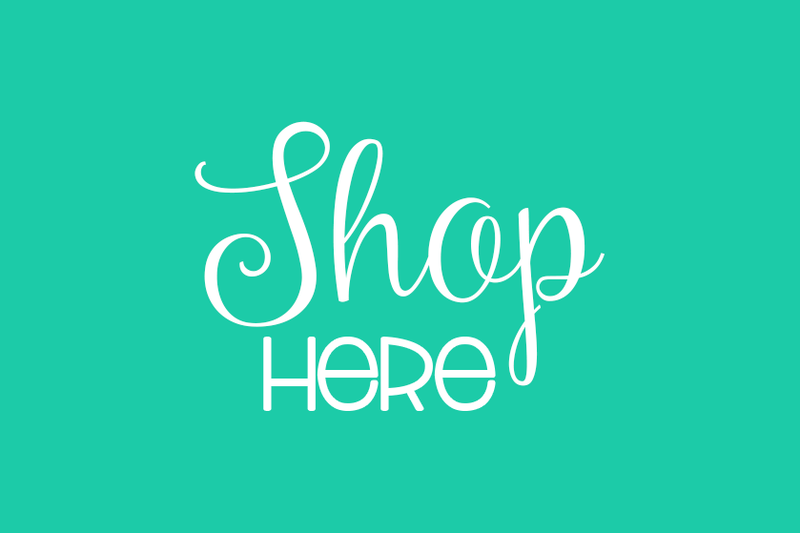 Candy banner from Hobby Lobby. Now, look to the left from my door and you see this. Lanterns are from Pier One and Hobby Lobby. Candy lanterns were wrapped in cellophane. Looking straight across from my door. Notice the curtain falling. Le sigh. The curtain fabric is from Joann Fabrics. Here's a closer look at the fabric. Don't mind little Miss Sadie laying on them. I was ironing them and then she decided she loved the warmness... 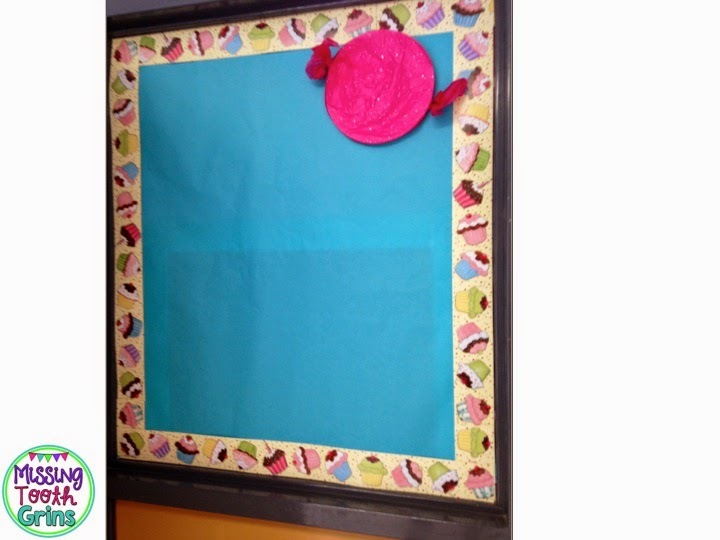 This fabric is actually what made me decide to do a sweet shoppe themed classroom! 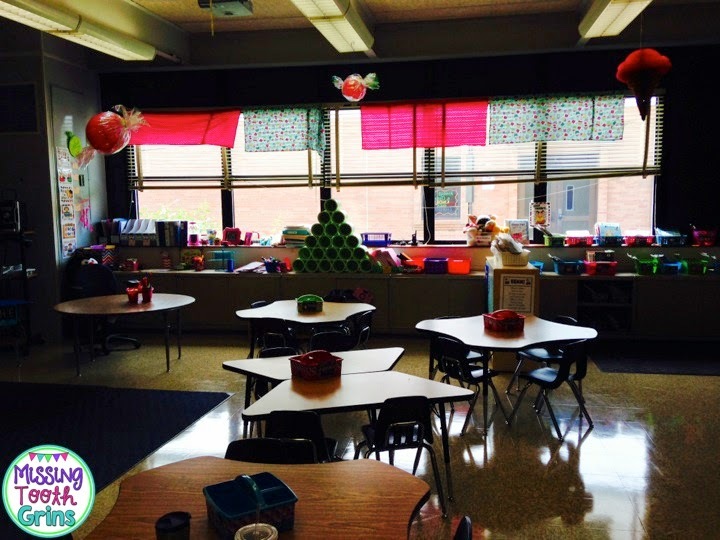 The view from my guided reading table. 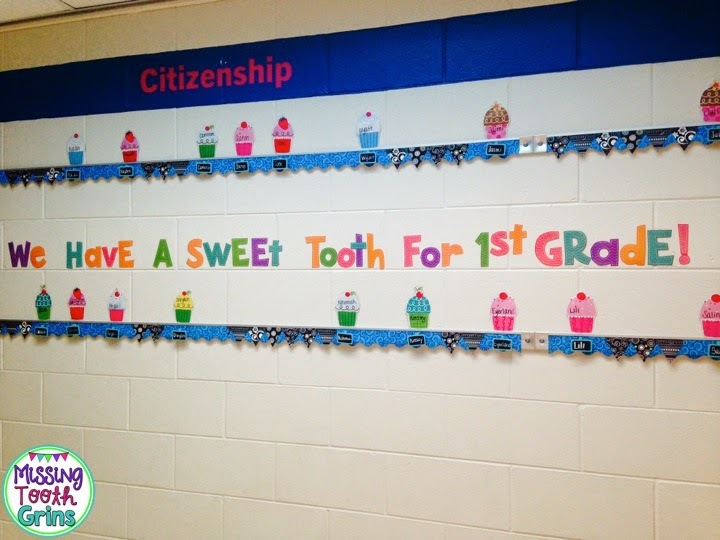 This was on Back To School Night so that explains why there's treats and goodies on the desks! 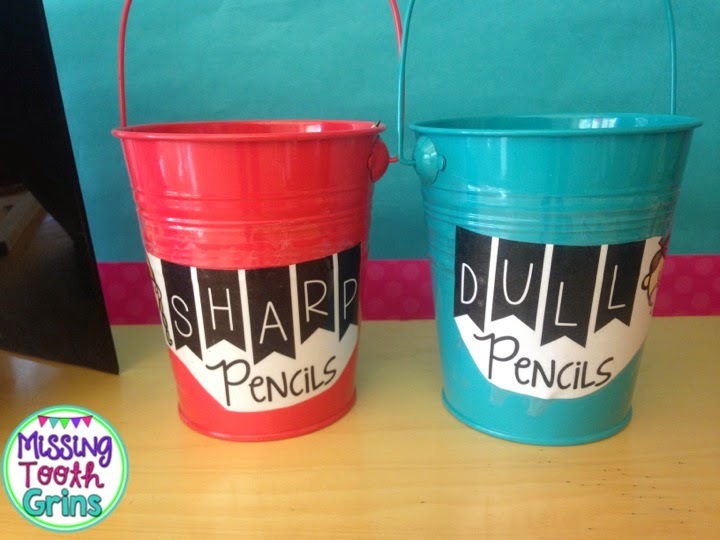 Class mailboxes and bins. Bins are from Big Lots. 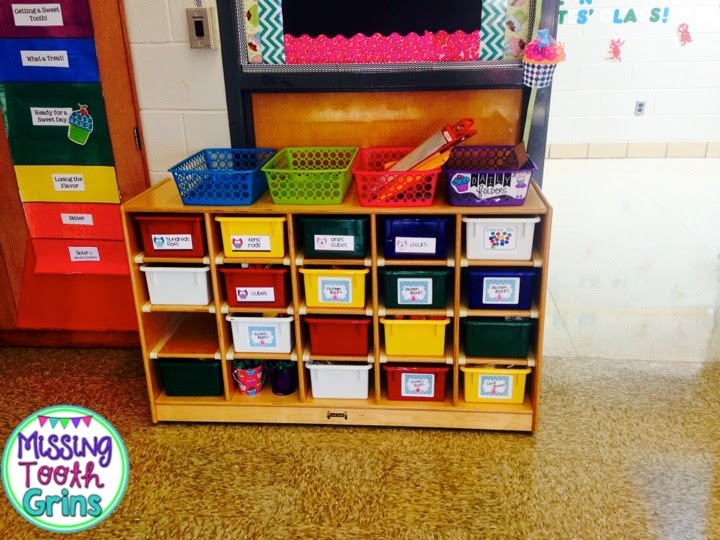 My grandma and grandpa made the mailboxes for me for my first year of teaching. I covered the back of the book shelf with wrapping paper from Target. 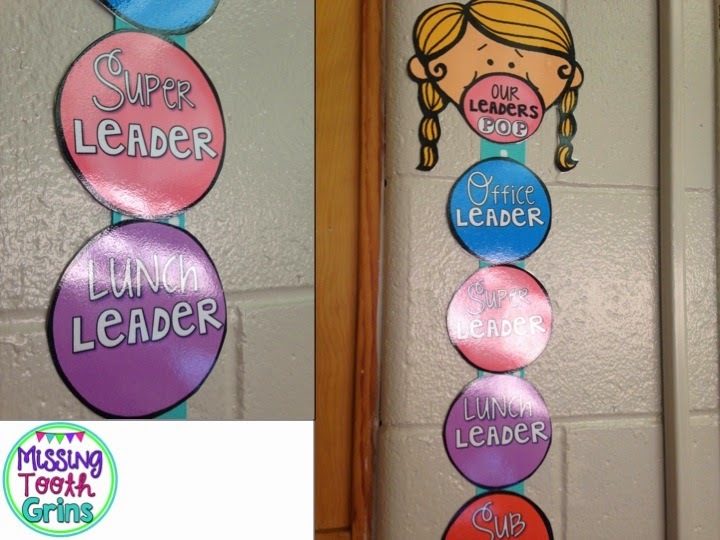 The pocket chart is for students to choose their lunch choice (lunch choice labels were added after this picture). 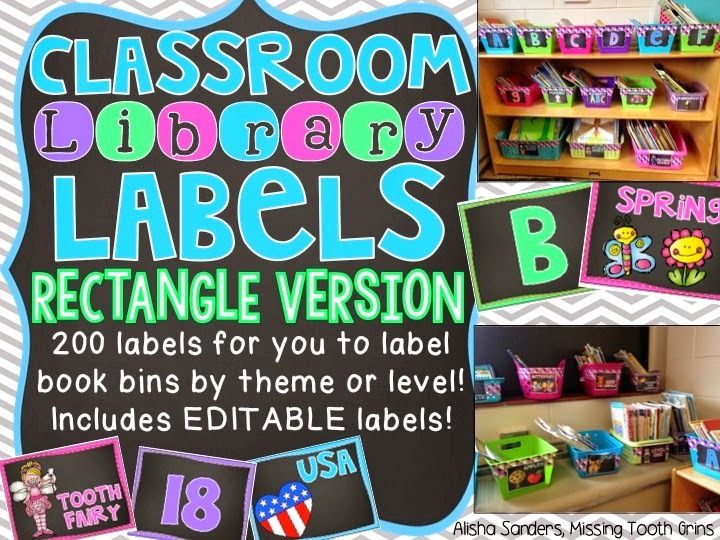 The poster is from Teacher Idea Factory and you can find the amazing pack here. 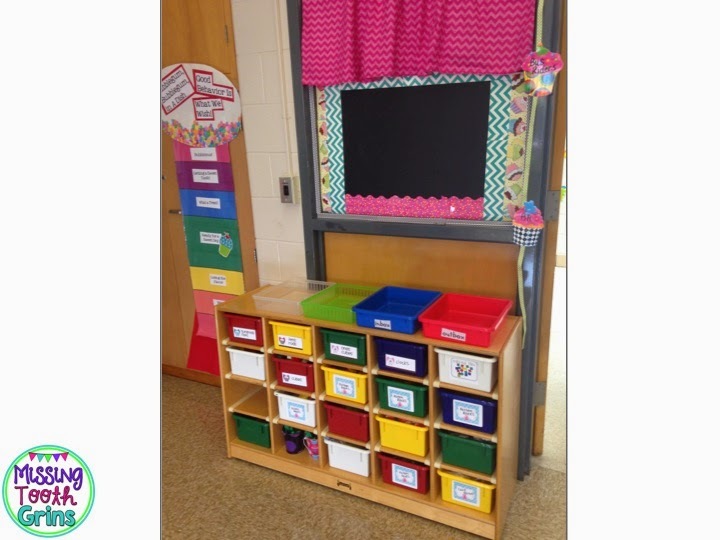 Here are some closer looks at the front of the room. 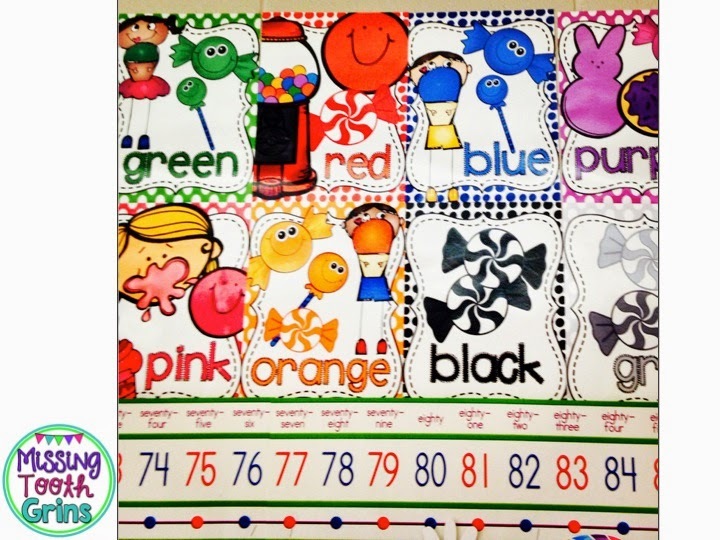 You can find the candy alphabet here. I can't sew, but I did make the pennant banner. The fabric is from Joann Fabric and Craft Store. 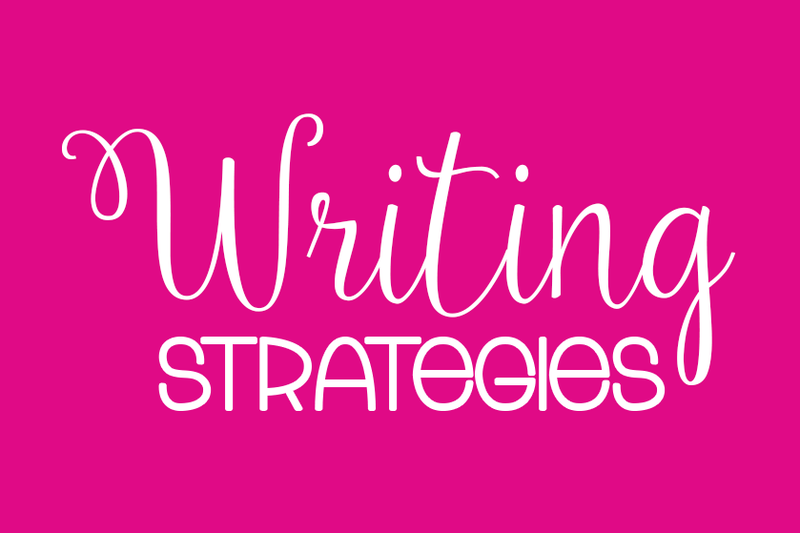 I followed the tutorial from Babbling Abby that you can find here. It was seriously the easiest thing ever. And cheap! The pink stool is from Michaels ($6!!). My I Can statements are easy peasy. It's just a poster I made and laminated. I write the I Can statements with dry erase marker and they come off easily with a tissue or magic eraser. Don't mind the mess of my electronic area. It's been moved to the proper place since I took this picture! 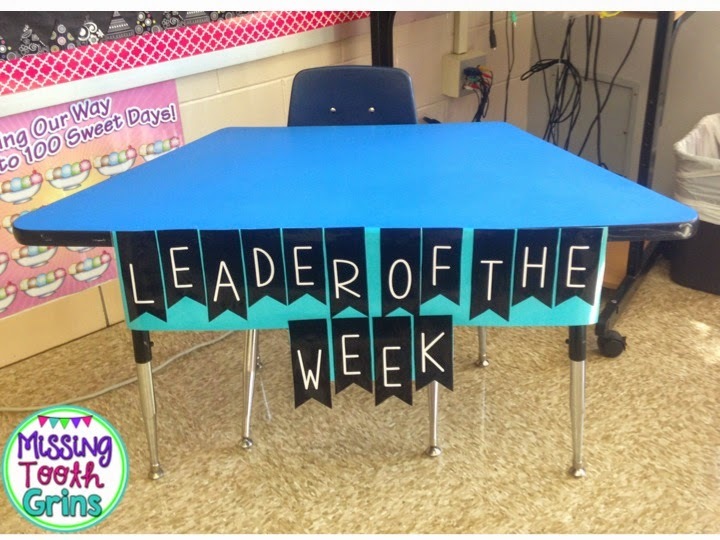 Whoever is my leader of the week gets to sit in this desk for the entire week. Believe it or not, kids get excited to sit alone at a special table. 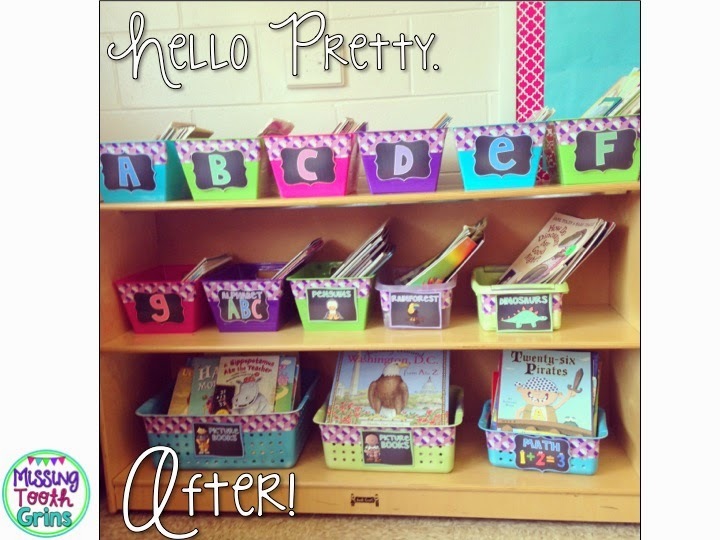 It is also right by my guided reading table (which I also double team as my desk). 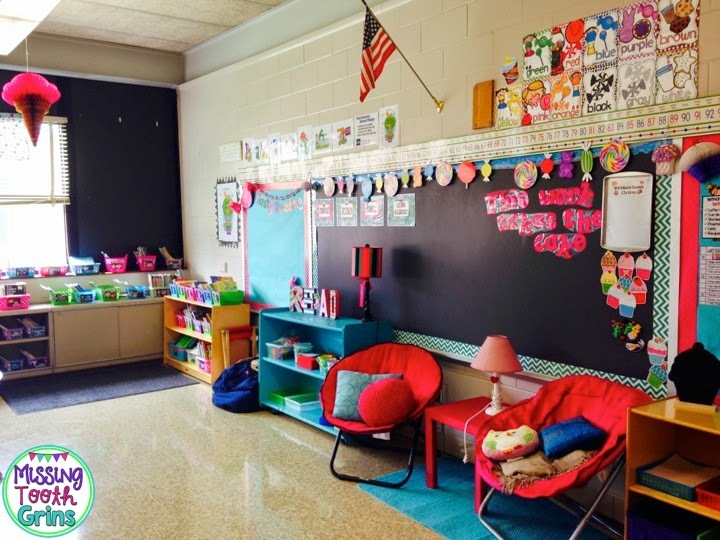 First graders still love to sit close to their teachers so it's the perfect (free!) reward! 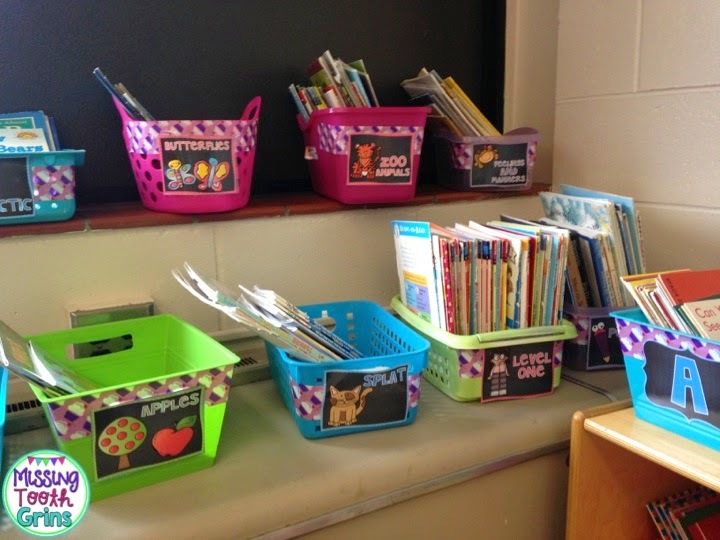 These are the students personal book bins for their books during Daily 5. 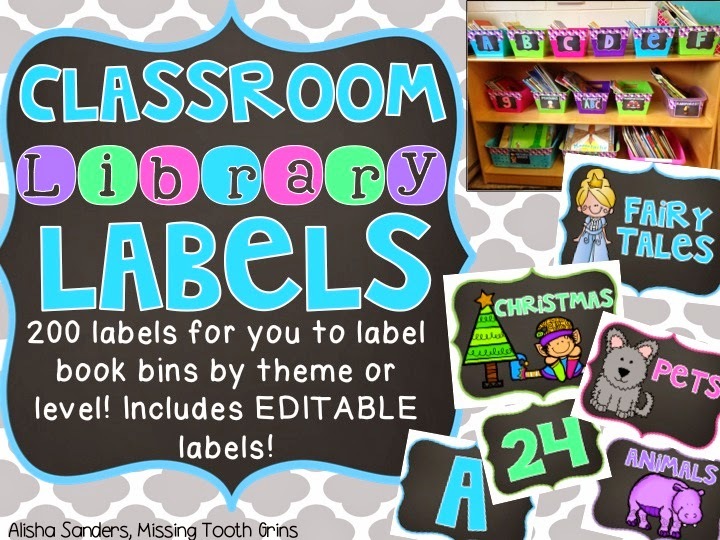 They still need labels. They are from Really Good Stuff. 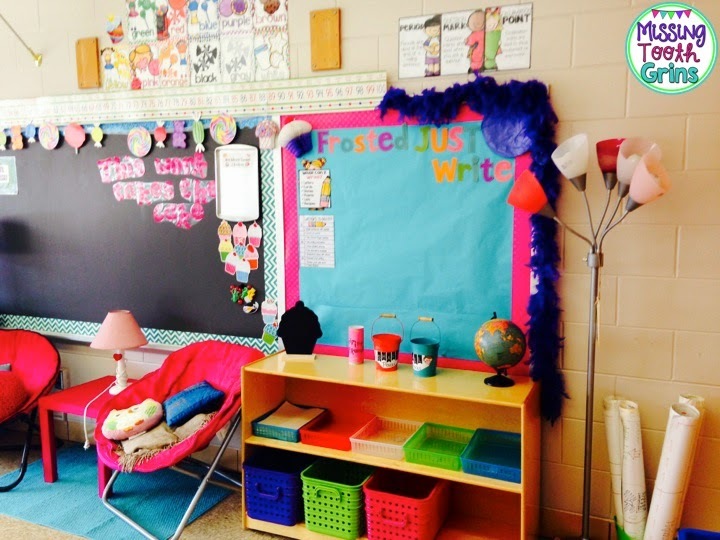 Here is the writing area. 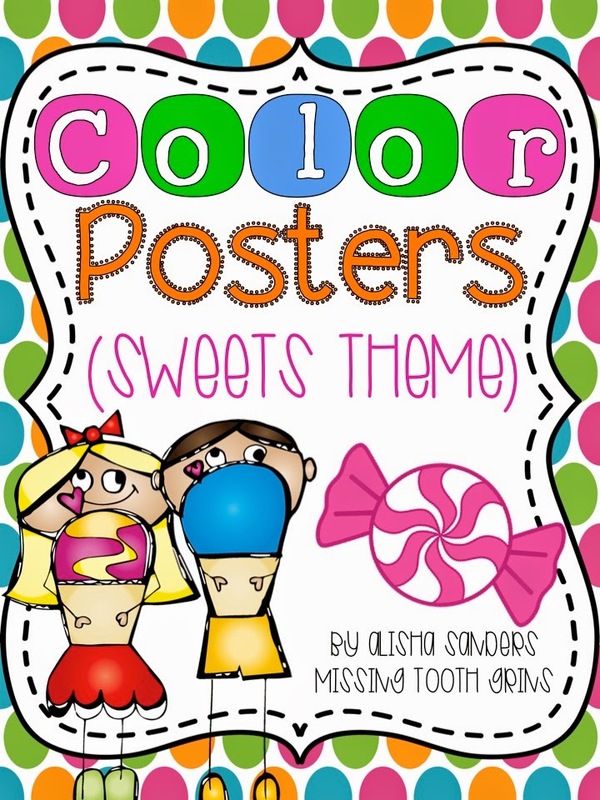 Writing posters are from A Year of Many Firsts and you can find them here. The big tubs are from Big Lots. They will be used for our Leadership Notebooks. 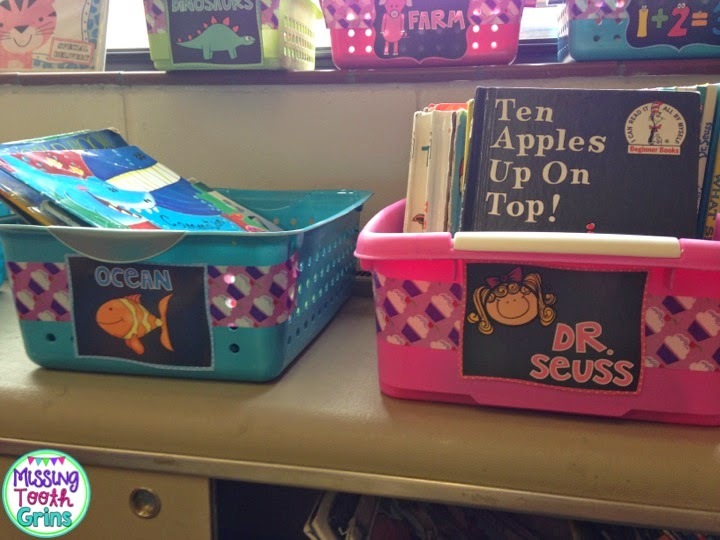 Trays are from Target Dollar Spot last school year. The lamp is from Target (but I found it at a garage sale!). 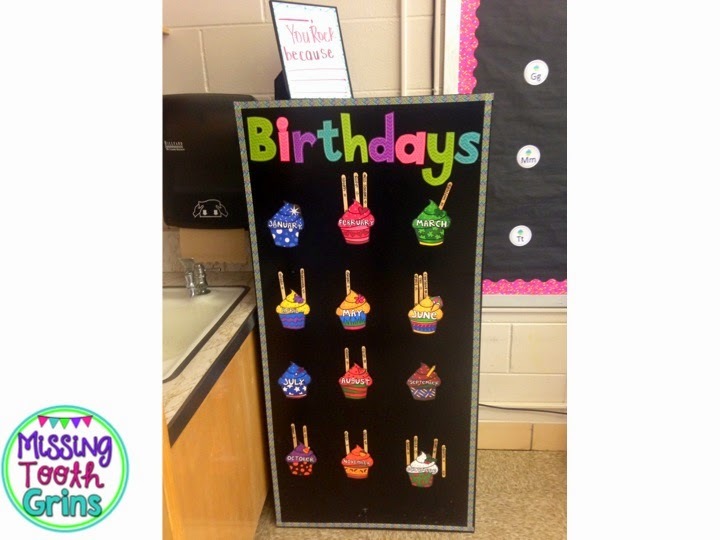 Cupcake Chalkboard is from Joann Fabrics. 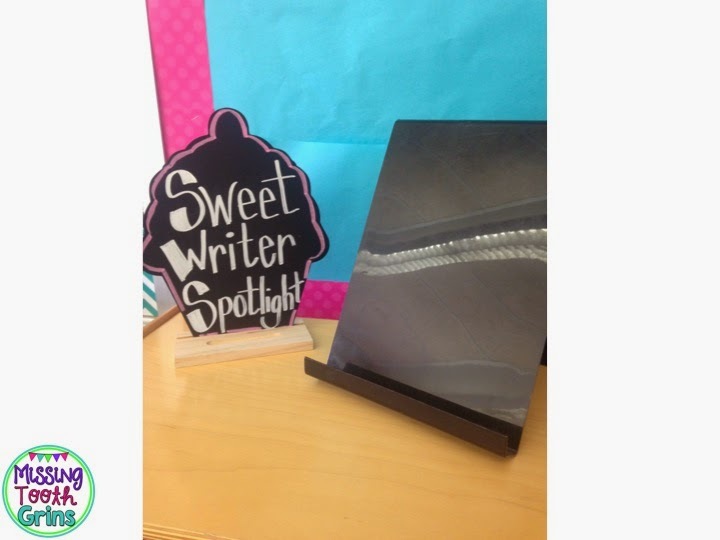 The tray that will hold the spotlight writer's story is from our local teacher donation store. These tins are from Michaels from the summer clearance aisle ($1.50 each!!). All my word work stuff is housed here. 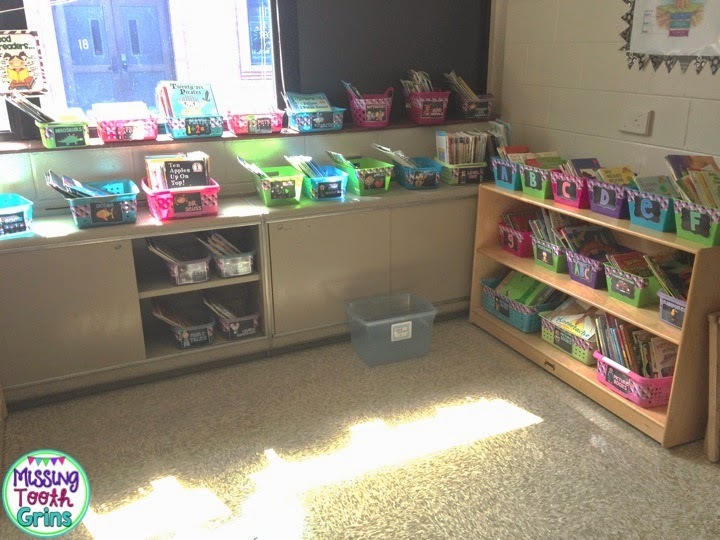 It's clearly not ready for students to use quite yet, so don't mind the mess. That lamp is from Hobby Lobby (last summer). Candies are made out of paper plates and gift wrap. 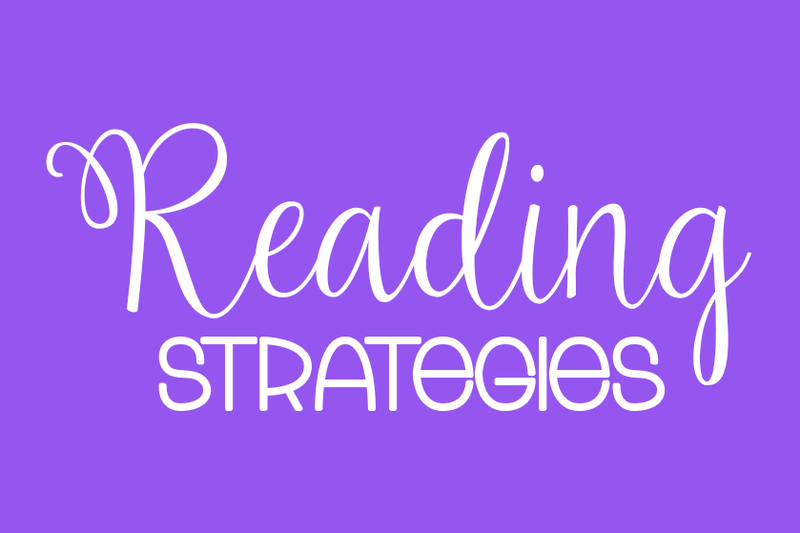 You can find my tutorial for the READ letters here. CAFE cupcake posters can be found here. "Tasty Reading" Letters are from Mardel and candy banner above those letters are from Hobby Lobby (Christmas section). This picture is all sorts of disappointing. The owl pillow that's been turned around is from Target (I got it as a gift from a sweet student though). The pink table and the chair on the right is from a garage sale. SCORE! The chair on the left is a coworkers (I had a black one that matched her room better than the pink so we swapped). Here's a close-up of the color posters. You can find the color posters by clicking the picture below. 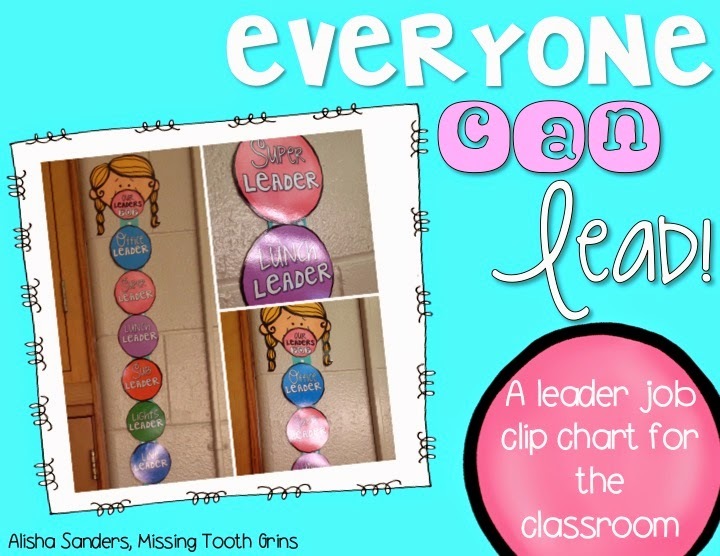 Moving along to my classroom leader job chart. It's a clip chart... Missing the clothespins for the time being. You can find that my clicking on the picture below. 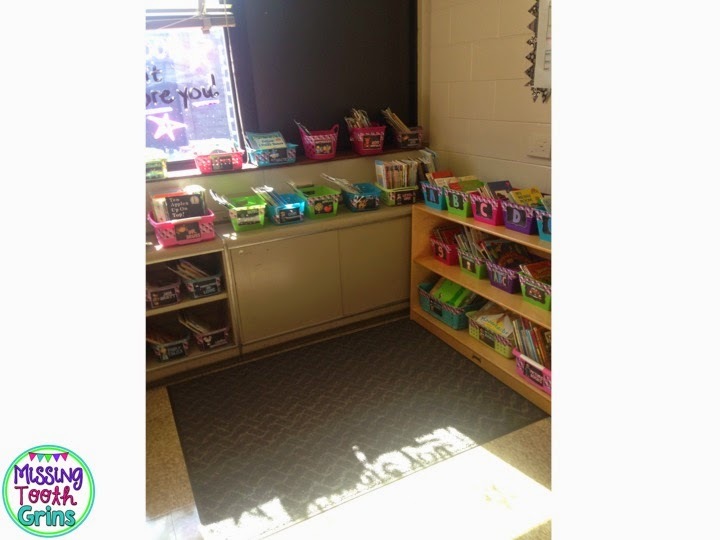 We have to cover our door windows and the windows in our classroom that look out into the hallway. The sweet shoppe board is actually a window. 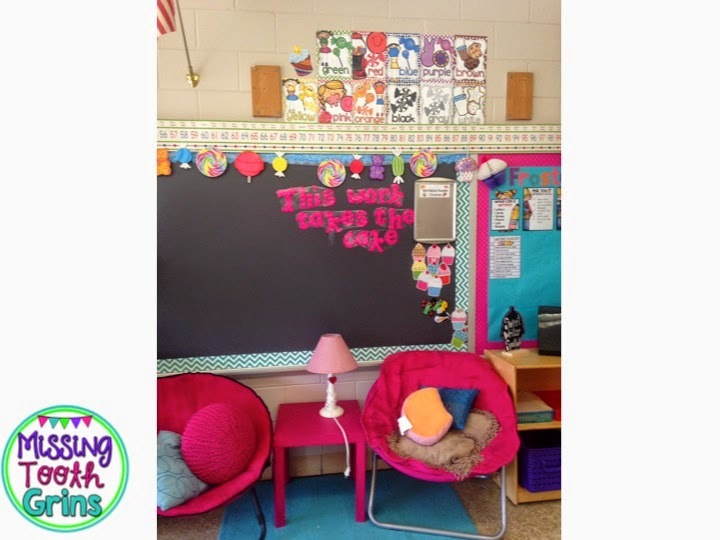 The chalkboard is actually chalkboard vinyl from Hobby Lobby. The cupcake and hanging candies are also from Hobby Lobby. Cupcake washi tape is from Wal-Mart. Cookie border is from Lakeshore. 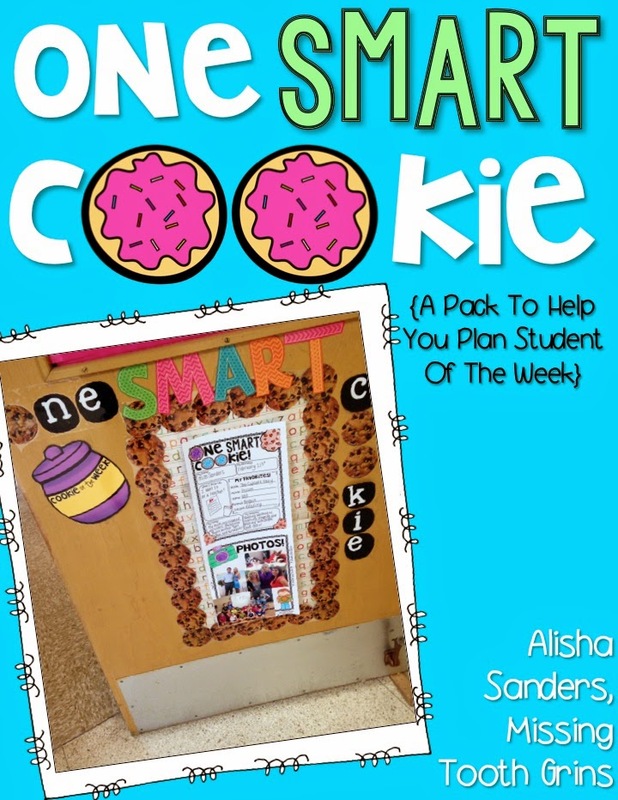 One Smart Cookie is the same as "Student of the Week" or "Leader of the Week". 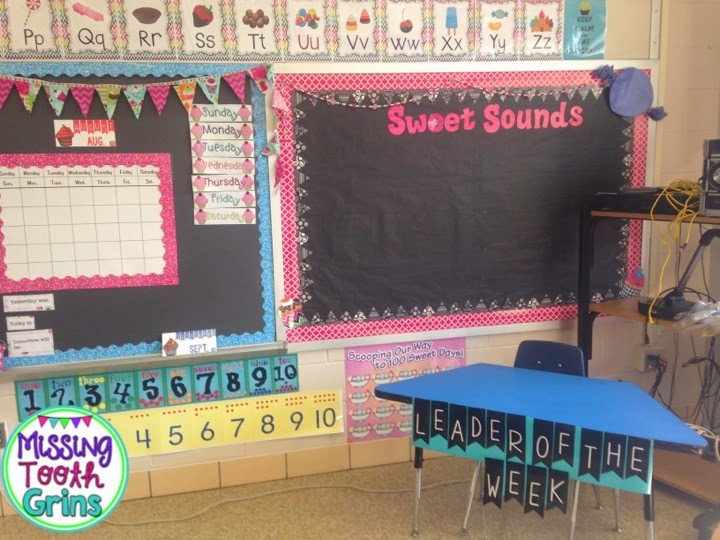 In my classroom, it will be the same as "Leader of the Week" and this person will sit at the special desk. Ahh! Isn't it cute? I love it! If you are interested in One Smart Cookie, click the picture below! 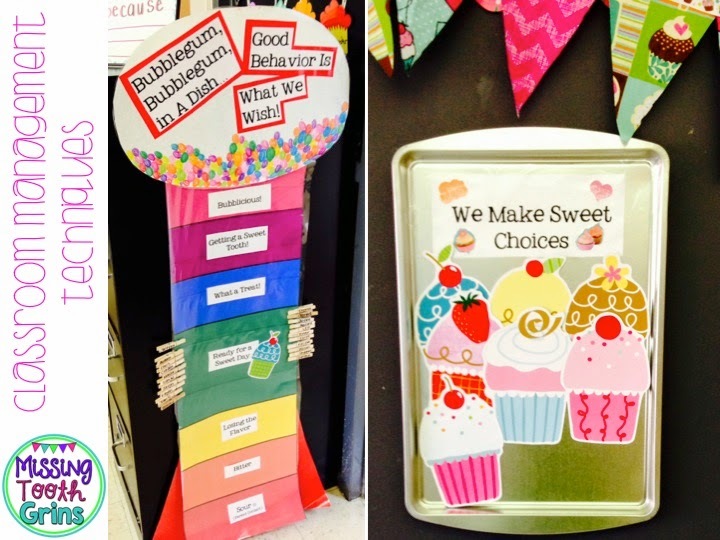 The cupcakes with ribbon is a clip chart that shows how students go home. 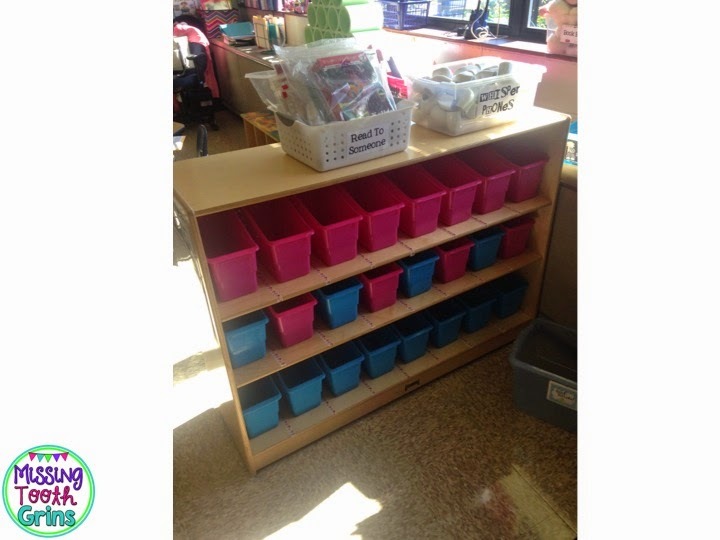 Math manipulatives are housed right by the door and under a window that looks out to the hallway. This is a sad picture. I still need to put labels (that match) on those tubs as well as the tubs on top. 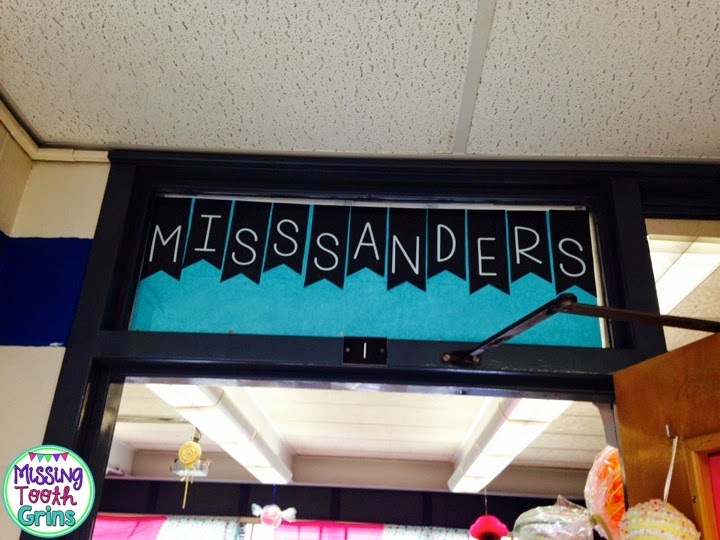 Poor quality picture, but I covered up the window with chalkboard vinyl, just like I did with the door window. 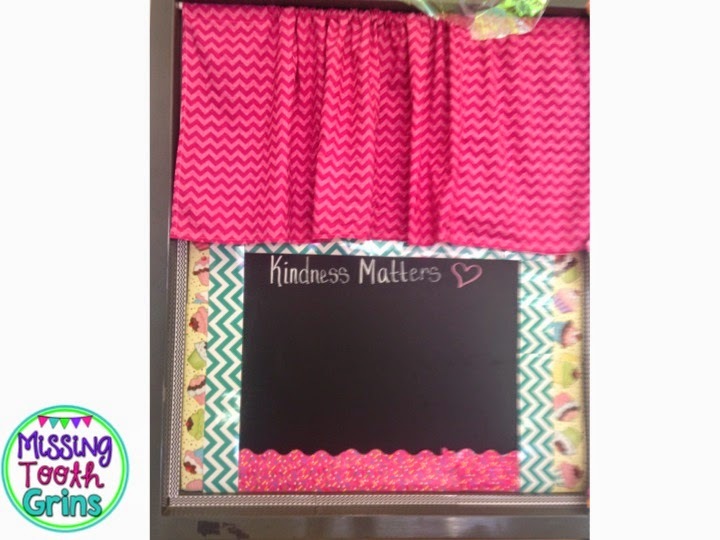 We will be posting about kind things that happen within our class on the chalkboard. It's the perfect place to post happiness and kindness because it's right by the door. So, every time we walk out the door, we are reminded of kindness and happiness. I will have to get a clearer picture and post it for you. The fabric is from Joann Fabrics. 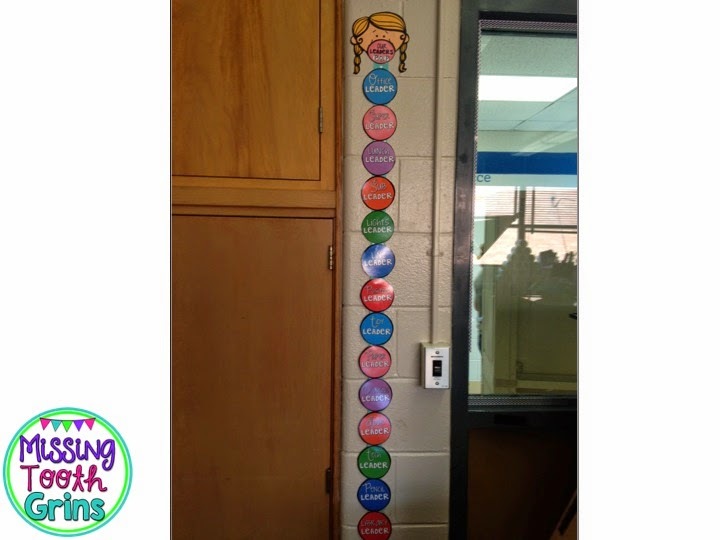 Here's a closer look at my clipchart and class rewards system. I didn't take a picture of them for the reveal (stupid me! ), but these pictures will do! Here's what the chart says (in order from top to bottom): Bubblicious, Getting a sweet tooth, What a treat!, Ready for a sweet day, Losing the flavor, Bitter, Sour (Parent Contact). The cookie pan on the right has magnetic cupcakes. 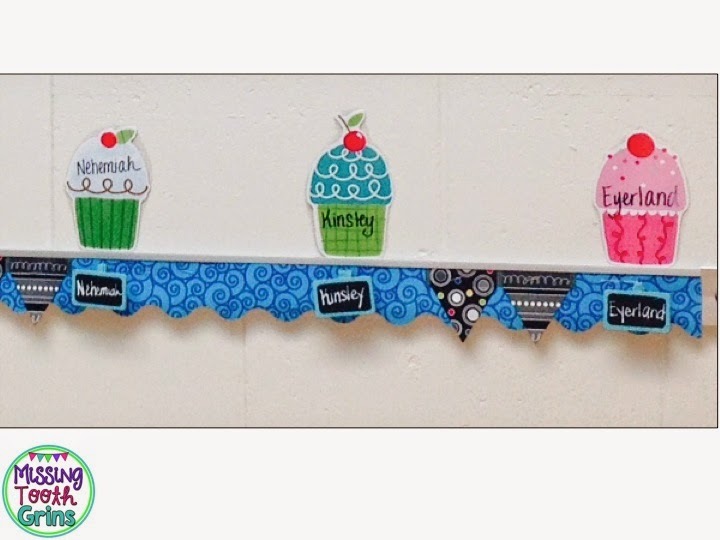 Each time our class receives a compliment, we add a cupcake. Once the pan is full, we celebrate. 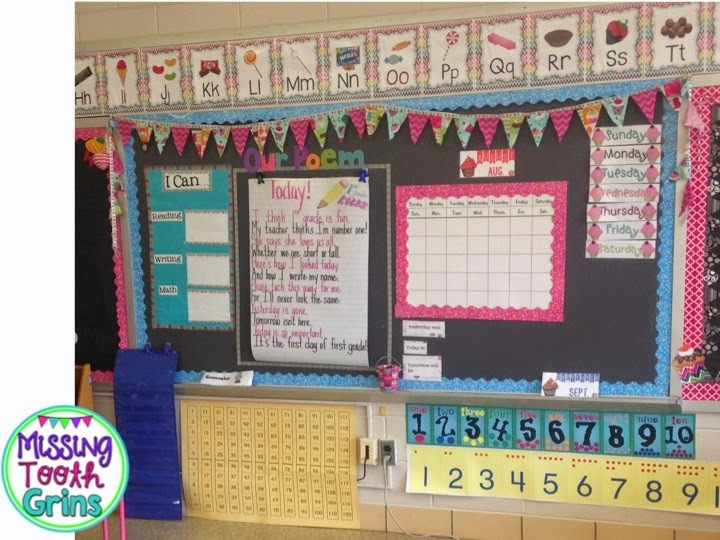 That blue border had been ripped in some areas from last year, but I had completely ran out of border from using it all in my classroom! All I had left was my pennant border. So, I cut in random places and just covered up the rips and tears that way. I'm pretty pleased with the outcome! Cupcakes are from Wal-Mart (last year). 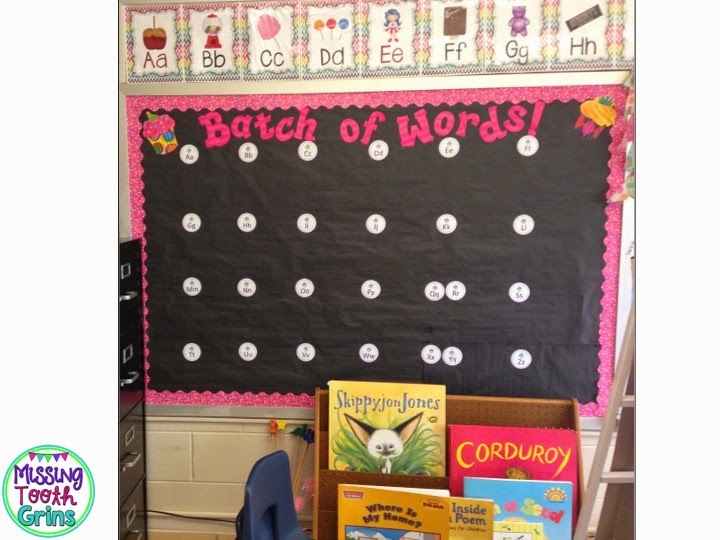 Chalkboard clips for holding student work are from Michaels. The other side of the window that looks into the hallway. This is right by the door. 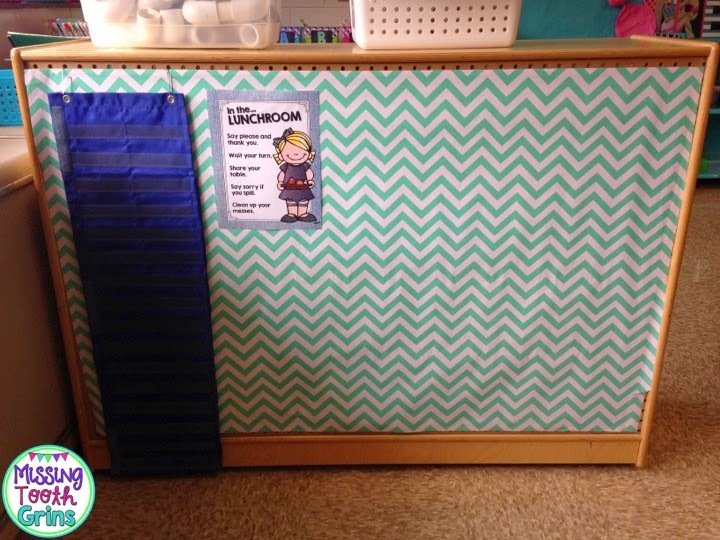 Just created my own little bulletin board with some wrapping paper (from Target). That little girl is a Scrappy Clipart from Graphics From The Pond that you can find here. Thanks for stopping by! I hope you enjoyed our happy place! 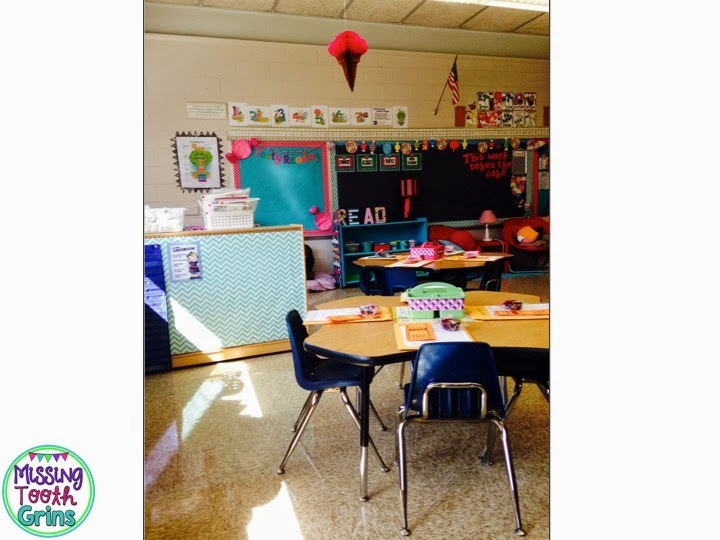 Make sure you click on the photo below to link up and check out some amazing classrooms! That WAS a photo dump...a dump I loved! 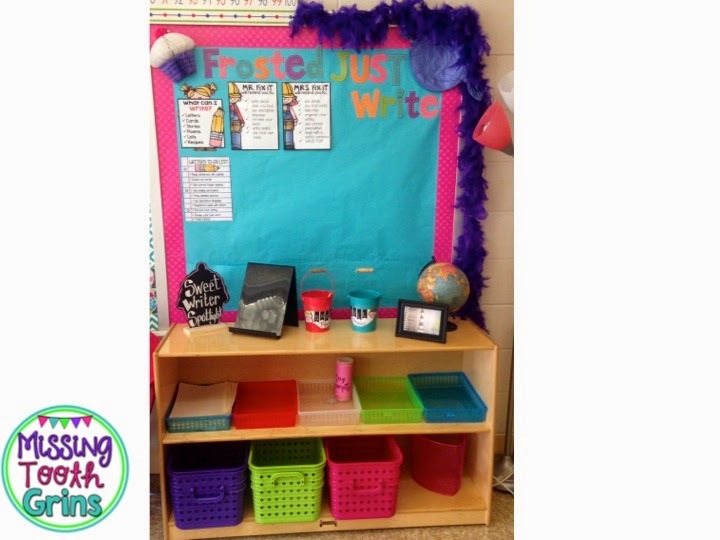 Your room is one of my favs I've seen! Great job! 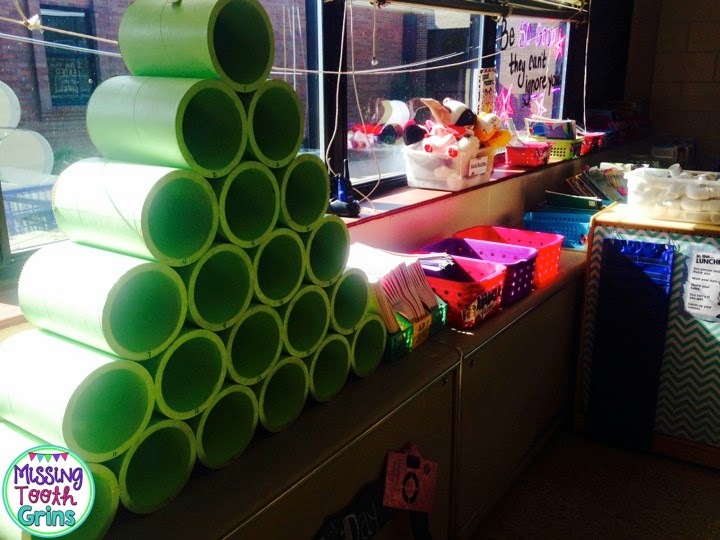 And your grandma and grandpa made you the mailboxes! That is the cutest thing I've ever read. Your room looks great! 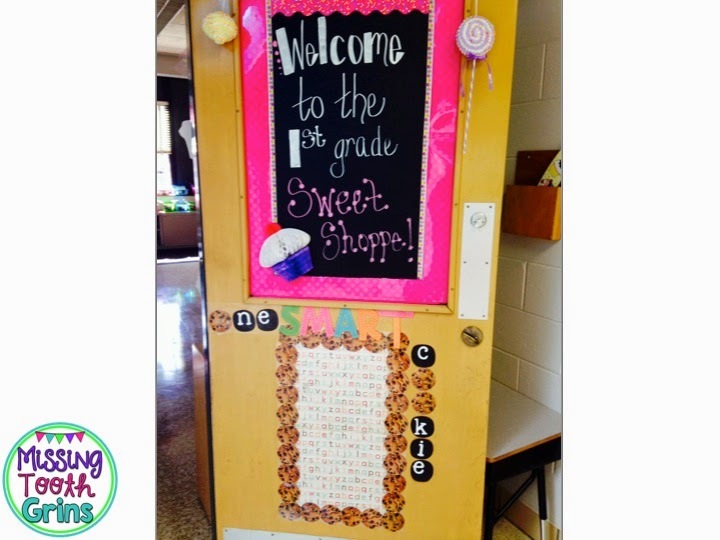 I'm laughing because I have a very similar last name and a sweet shoppe themed classroom as well! Funny! 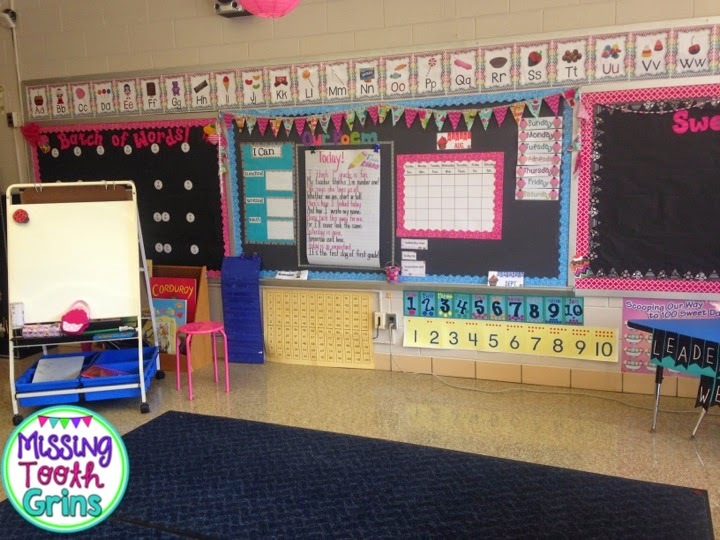 Your classroom is so stinkin' cute! 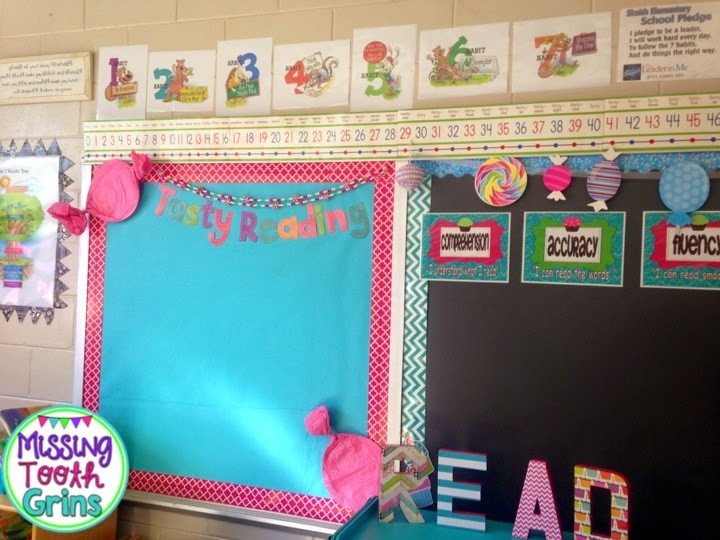 Love the displays and the colors! What a fun room with all your products! 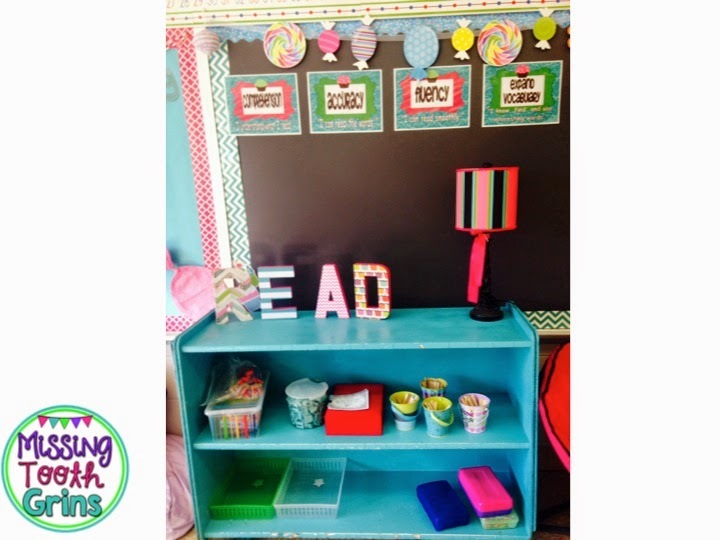 Love the leader table and the bubble gum and cookie thing...amazing! 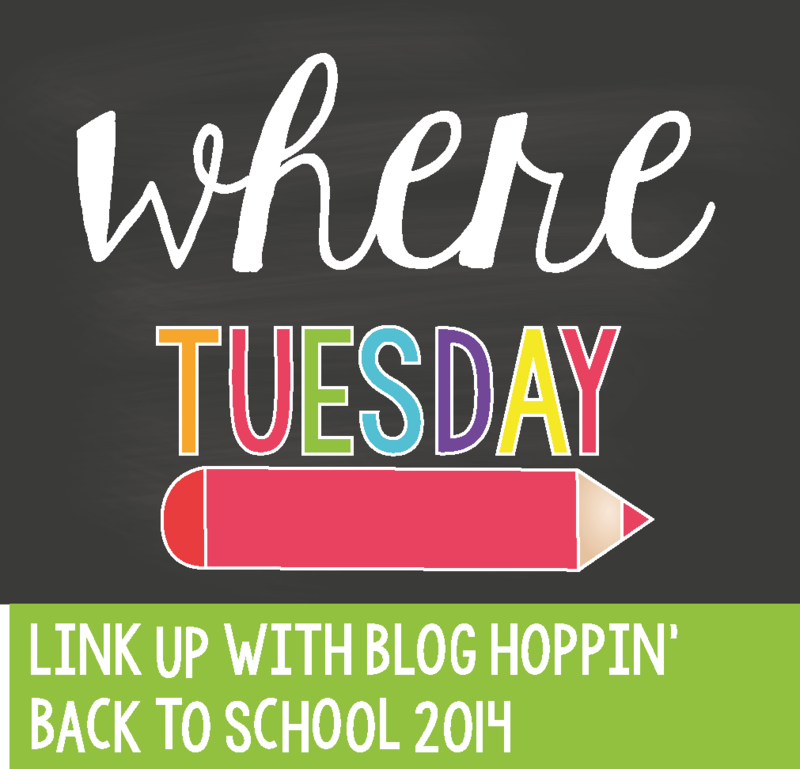 It is great to blog hop and look at what everyone is doing to get ready for the new school year. My Favorite Things! Come Enter To Win Too! 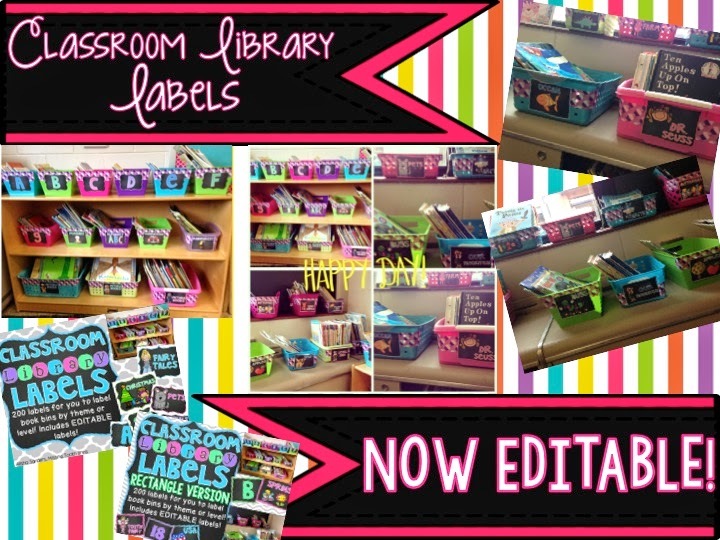 Back To School Product Swap! And a GIVEAWAY!